Traffic cones were definitely not what I thought I’d see at Versailles! And you know what else? Way down there, at the end of the row of cones, there’s razor wire. 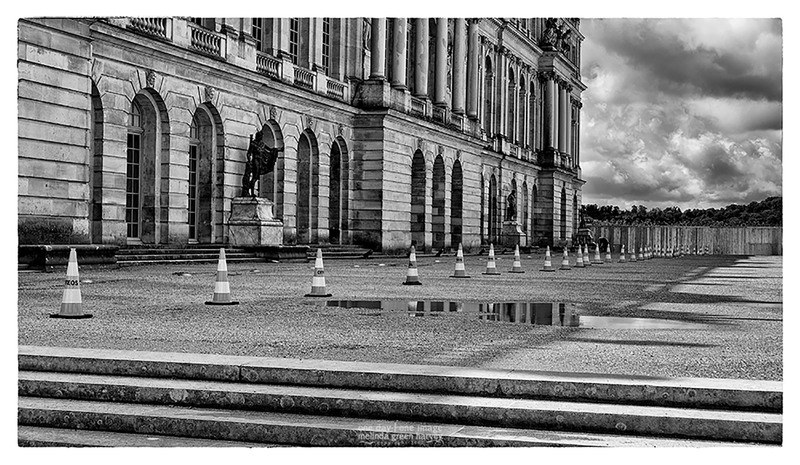 Posted on August 6, 2017, in Photography and tagged 365 photo project, architecture, black and white photography, France, learning to see, Leica, melinda green harvey, monochrome, one day one image, photography, postaday, thoughtful seeing, travel, travel photography, Versailles. Bookmark the permalink. 4 Comments. Would those be authentic 17th century cones and razor wire? I assume so. Authenticity and etc. Guess it would be hard to use artistic or emperial cones and razor wire . Sort of ruins the experience as it is now. I guess I expected the cones (and razor wire, come to think of it) to be gilt. It seems the least they could do.